Star Clippers operates three of the largest barquentine and full-rigged sailing ships in the world. Star Clipper, Star Flyer and flagship Royal Clipper offer the activities, amenities and atmosphere of a private yacht in a unique sailing experience in harmony with environment and sea. Star Flyer and Star Clipper were the first clipper ships since 1911 to be granted the certificate of Sailing Passenger Vessel (SPV) by Lloyd’s Register of Shipping. They are both four-masted, square-rigged barquentines, 360 feet long, with 36,000 square feet of sail and carry up to 170 passengers and 75 crew members. They hold the record for the tallest mast in the world at 226 feet above the waterline. 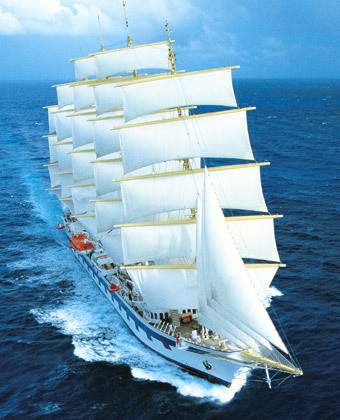 Royal Clipper is the first five-masted, full-rigged sailing ship to be built for over a century. She is the largest true sailing clipper ship in the world, and carries 42 sails (26 squaresails, 11 staysails, 4 jibs, 1 gaff-rigged spanker) with a total area of 56,000 square feet. At sea, Royal Clipper is under sail power as much as possible, with sails set for minimum heeling, usually held to less than 6%. Royal Clipper accommodates 227 passengers and 105 crew members, of whom 20 are needed to handle all sails. The remaining 85 crew members serve passenger needs or are on support duty.